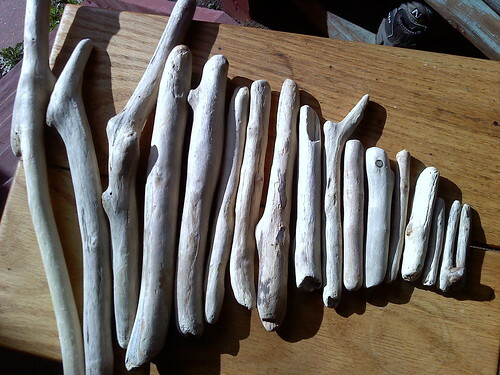 Last fall while visiting with my friend Jen in Findley Lake, I drove a few miles up the road to Northeast, PA and wandered the beach of Lake Erie gathering up these amazing pieces of driftwood. Strange as it may sound, this was my first time really seeing driftwood in any kind of abundance. Instinctively knowing that I would put them to some crafty good use, I bought them home and now they await a project. I used one of the sticks in the above picture. These are whatever you want them to be. 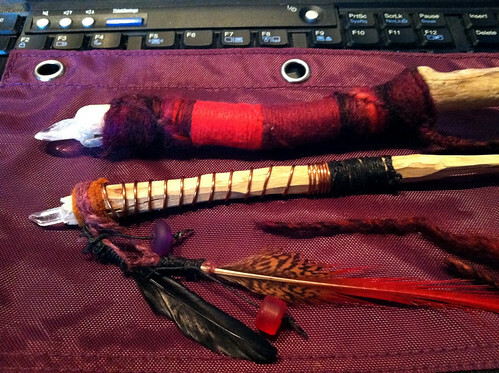 Magic wands, Talking Sticks. or simply decoration. Pieces of leather, a coil of copper, feathers from the craft store pretty, pretty yarns and crystals. Quartz in the one, Danburite in the other. I'm thinking of making more like these- maybe painting a few. Beautiful, Beautiful, Beautiful! You have inspired me...even for something I need to have on-hand for tomorrow evening. Thank you, Steph. I just found you through the artist blog hop and I'm so glad I did. ILOVE what you are doing with the sticks. My hubby has to laugh at everything I collect and keep for art projects - glad I'm not the only one! I wonder if you could decorate these with some sort of spiraling mandala? Yes! Painting on them would be cool. Regardless, what you've got here is yet another art form. I can see one hanging over my desk at home to call the creativity spirits to me.